The concrete walkway outlined with a brick wall has plates containing all 119 past PRS presidents' names. The Gold Award Garden is now wheelchair accessible. Click here for a listing of all Gold Medal Winners in Portland. In 1967, Rudolph Kalmbach the curator of the test garden wanted a formal rose garden for planting all the Portland Gold Award winning Roses because this award was noted nationally. He and PRS 1967 President Peggy Leonard decided to present his idea and dream to the PRS board for approval. The board endorsed the idea and thus began Dorothy Butler’s involvement and dedication regarding the Gold Award Garden. Dorothy was chosen to chair this project. Dorothy knew this needed an expert for design and layout and she chose what she considered the best. The board agreed with her Selection of Wallace Kay Huntington noted landscape architect to design the Gold Award Garden. 1970 PRS President Lloyd L. LeClair hosted the first fundraiser for the Gold Award Garden at his home in Milwaukie of which several hundred members and guest attended. The Auction raised hundreds of dollars for the Gold Award Garden and will long be remembered by all who gave their time and donations towards its success. The Garden completed, the members of the PRS Proudly witnessed the Gold Award Garden Dedication that June of 1970 by President Lloyd L. LeClair. All of the Portland Gold Medal Award winning Roses from 1919, to present are now in this special garden thanks also to Rueben Newcomb who was responsible for budding new plants. Each year several Portland Rose judges picked a new rose to add to the Garden you see today and that practice will continue for the benefit of our citizenry and visitors, local and abroad. This project idea has unfolded years of labor to give this city a one of a kind garden worldly, of exquisite prize roses where anyone can visit and admire. There are two other similar gardens, one in France and one in Spain. However, The Portland Rose Society Gold Garden is the only Gold Award Garden to be awarded the highest award for a Gold Award garden. We of the Society take great pride of this superior accomplishment. Several years later, in December of 1986 a second fund drive was approved by the PRS board to build a Pavilion and brick wall to allow additional space for planting more roses, Peggy Leonard’s success with the Gold award Garden proved her ability to chair like projects, and once again she enlisted Mr. Huntington’s excellent architect design. In the Fall of 1991 the Pavilion was completed. The Pavilion has become an exceedingly popular choice for Local Weddings. 1991 PRS President was Dave Erickson and 1992 PRS President Paul Raab In the Fall of 2003 with Paul Raab’s idea, Dorothy Butler got approval of the board to start a third garden project, a Presidents Wall, and walkway. 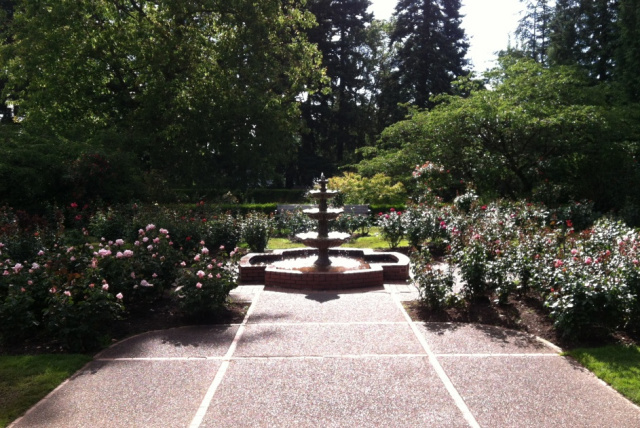 It was only fitting that the garden had a record of all past President’s of the Portland Rose Society who had helped to make this City, Portland, the prize winning, the only one of its kind, Gold Award Rose Gardens in the entire world. Therefore, it is today, 42 years since the onset of the Gold Award Garden’s projects that we honor The Presidents of the Portland Rose Society. Over an entire century of dedicated men and women, all who labored to make their city, Portland, Oregon, the grandest city of an honored “Gold Award Rose Garden” the best in all the world. This dedication is a historical event, long to be remembered. Many thanks to the many who came to witness this grand event, The President’s Wall dedication.